A ‘lobby card’ usually featured an image from the film that was being played at the theatre and was displayed in the glass-pane covered notice boards that characterized the lobbies of most single screen theatres in those days. 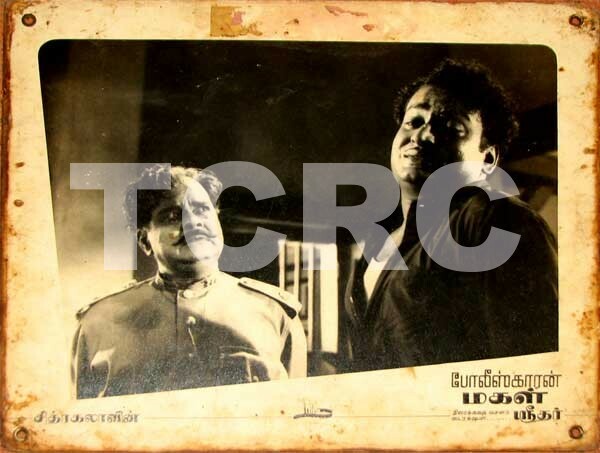 This is the lobby card of “Policekaaran Magal,” a successful Tamil film released in 1962. The screen play for this was by B.S. Ramaiah, whose son R Shankar was my clasmate in engineering. The film was directed by Sridhar who went on to direct other superhits like, Kalyana Parisu, Kaadhalikka Nermilla and Nenjil or Aalayam.